I am the owner of the Japanese sake restaurant "Chinju no Mori". 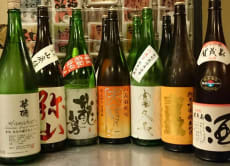 This place is well known as the most secretive Japanese Sake restaurant, which owns a collection of more than 4000 bottles of Japanese sake. "Chinju no Mori" is frequently quoted as the "sacred place of Japanese sake lovers". Even though we are a closed membership only restaurant, we are willing to open our place to non-Japanese travelers in order to expand the fan base of Japanese sake. Great izakaya experience, not only the sake tasting but the dishes as well.